The Haveli Hari Ganga Hotel in Haridwar re-defines opulence with its host of royal services! 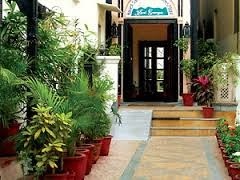 The Haveli Hari Ganga Hotel in Haridwar is where modern and contemporary meet culture and history. Standing as a proud example of heritage hotel in India, this inn has won many accolades for its melange of offerings for discerning guests. From the very instant that you enter through the doors, a soothing atmosphere will engage your senses and surround you with kind and exquisite service. The grand hotel in Haridwar evokes a sense of graciousness while affording panoramic views of the sacred river Ganga and scenic hills. It boasts of 20 beautifully appointed rooms decorated with antique arabesques, regal beds made of stone and matching upholstery offering a marriage of the finest materials. One can take advantage of the utilities proffered in these private spaces such as LCD TVs, hair dryers, Wi-Fi, steam rooms and much more. Further pleasing the guests are additional services such as newspapers, welcome drinks on arrival and two complimentary mineral water bottles every day. This commendable hotel promises luxurious comfort, sophistication and a level of personal attention that can not only be seen but also felt. In order to make your stay in Haridwar much more gratifying, the resort also serves lip-smacking vegan delights. Thus, your Stay in Haridwar is sure to transform into an extravagant affair with the immaculate facilities offered at The Haveli Hari Ganga Hotel. What this remarkable lodging brings to you is much more than a comfortable sojourn. So experience the true essence of Haridwar with an infusion of regal treatment at this hotel.